Sir John Templeton (1912-2008), one of the greatest investors and mutual fund managers of all time founded the Templeton Growth Fund in 1954. It started in US but was one of the first mutual funds in US to invest in many countries globally. India is also one of them. 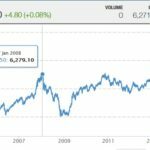 In India it is the Franklin Templeton India Mutual Fund. 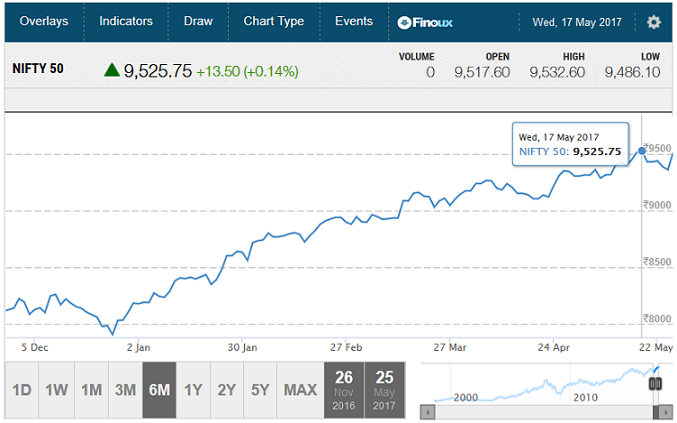 Nifty from 8000 levels has now today as on 26-May-2017, has reached 9500+ level. This is an increase of 19% in a five months. There are four stages of a bull market – pessimism, skepticism, optimism, euphoria. I may be correct or wrong but my perception is we are in the third stage – Optimism. US is in a very dicey stage. There are talks going on for impeachment of US president. Frankly there is no big news in India and US or any other country of great economic revolution. Is the world or Indian economy 19% better than it was in December 2016? No. It might be better but nowhere near 19%. It is just optimism or hopefulness and confidence about the future or the success of something that has brought Nifty from 8000 to 9500+ levels. If you look at history every bull market ended up with a bubble. Especially the stock market crash of 2008, the world bubble after an euphoria. Stock markets all over world tumbled 50%. Well that will not happen for sure as the world has adopted strict measure to make sure recession does not happen again. Even if recession has not happened this is a place where we can expect some kind of reversal if not bubble. Every time there is a strong bull run, hedge fund positioning and investments becomes a major headache for stock markets. Before the stock bubble or 2008, hedge funds had overbought tech and banking stocks. Once the bubble hit, both the tech and banking stocks tumbled bringing the stock markets the world over down 50%. A recent Goldman Sachs report on hedge funds is showing similar pattern now in 2017. Hedge funds have invested most of the their money in small stocks on top of that they have not invested too much in hedging there portfolios. This is seriously bad news if a bubble hits in. Since hedge funds invest in billions of dollars, if they start losing money and if not properly hedged the first thing they will so is start taking stop loss. Do not forget that to close their position they will have to sell their stocks. Basically Sell will overpower Buy. Bears overpowering Bull is a signal of stocks going down. Once hedge funds crack they have the power to bring stock markets down. Another problem with hedge funds is that they use leverage to borrow and increase the size of their bet on stocks they hold. Some hedge fund managers are over confident of their investment decisions therefore leverage too much without hedging their bets. As hedging takes money to hedge they do not hedge due to overconfidence. Once they see any sign on weakness in the markets they sell off all their holdings at once. Here is where is the problem. If all hedge funds sell off then there will be a bubble just like the bubble of 2008. However if the sell off is a few days apart, the markets will come down slowly. It is well know that hedge fund managers are smartest people in the investing world, but if they do a mistake, everyone suffers. What I have written above is what hedge funds are doing in the US markets. But do not forget that if US markets fall, Indian markets too follow through. Disclaimer: This article is based on what is happening in the world of stocks markets especially US. There is no guarantee that we are near bubble or the stock markets will fall. It is based on pure research done by me. I am in no way responsible if based on my articles anyone takes an investment or trading decision. No one can predict the future, but everyone has the right to research. This article is based on my research. Keep up the good work… and such useful articles coming.